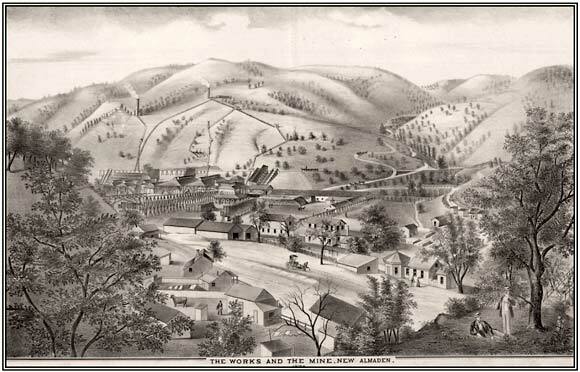 The New Almaden Quicksilver Mines - established in 1847 and named for the world famous mines of Almaden, Spain - were once the richest mercury mines in North America. New Almaden mercury was used in sluice boxes during the California Gold Rush to amalgamate with gold. Between 1850 and 1875, miners extracted a total of 46 million pounds of liquid mercury from ore taken from the New Almaden Mines. Visitors can see remains of the mines – closed since 1976 – and learn about their history at Almaden Quicksilver County Park. Unfortunately, the mines have left a legacy of mercury contamination that is of continuing concern in the Guadalupe River watershed. Mercury was refined from cinnabar, a reddish rock found in the hills at New Almaden. Crushing then roasting the cinnabar to extract the mercury leaves a waste product called calcines. Miners left calcines and other mining rubble in heaps, often adjacent to the streams. Mercury-containing sediment now washes from these heaps into the streams and reservoirs, making its way to the San Francisco Bay. 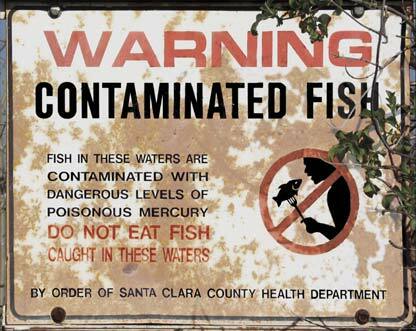 Mercury in our waterways and bay concentrates in the food chain, rendering many predatory fish unsafe to eat. The most dangerous form of mercury is not liquid mercury, the well-known quicksilver valued by miners, but a compound called methylmercury. When mercury sits in the sediments of oxygen-poor waters of lakes and wetlands, bacteria produce this potent neurotoxin from the mercury. It is taken up by algae, then it concentrates as it moves from algae, to zooplankton, to prey fish, to predator fish, and finally to humans. To protect the public from the dangers of eating contaminated fish, warning signs near local ponds and reservoirs instruct anglers not to eat their catch. Local agencies are employing multiple strategies to reduce mercury contamination in the river and San Francisco Bay. First, they are trying to keep the mercury-containing sediments from reaching the bay. A primary strategy is to remove the contaminated sediments in streams such as Alamitos Creek. Existing drop structures (low concrete dams) can serve as sediment traps along the course of the river that can be cleaned out periodically. Mine wastes themselves are excavated and disposed of in an appropriate landfill. Santa Clara County has already undertaken major calcine removal efforts in the park. Elsewhere, contaminated sediment may be stabilized and capped by covering the waste piles with clean soil and vegetation, thus trapping sediments near the source and preventing leaching into local waterways. Local agencies are also trying to prevent the existing mercury in the river from becoming methylated. That may mean redesigning the channel so that water does not sit in deep, still pools where oxygen is low. Research is underway to study a localized water circulator installed in Lake Almaden to see if methylmercury production is reduced. If the pilot project is successful, oxygenation of other reservoirs may be considered. Scientists and watershed managers are working to remediate the problems, and protect fish, wildlife, water quality, and human health. However, while these reduction efforts continue, mercury contamination remains a fact of life in the Guadalupe River watershed.